These traditional chairs have a southern feel that I just can't get enough. They came with a striped seat cushion that by no means would work with my existing furniture. My immediate thought was, "I can do this". I can change the fabric and have a brand new chair. And so I did! Went to Hobby Lobby, found a red and white chevron fabric, and decided to give it a try. I removed the loose cushions, lay the fabric down and placed the cushion upside-down on top of fabric. I then proceeded to cut the fabric around the cushion, leaving enough fabric on each side to fold over and staple the heck out of it. LOL! Is a fairly simple procedure. Anyone can do it, and the satisfaction that it gives you at the end is priceless! I have seen chairs like these sell at local antique stores for over $75.00 dollars. This project didn't cost me more than $20 so my heart swells with pride, happiness and a huge sense of accomplishment. 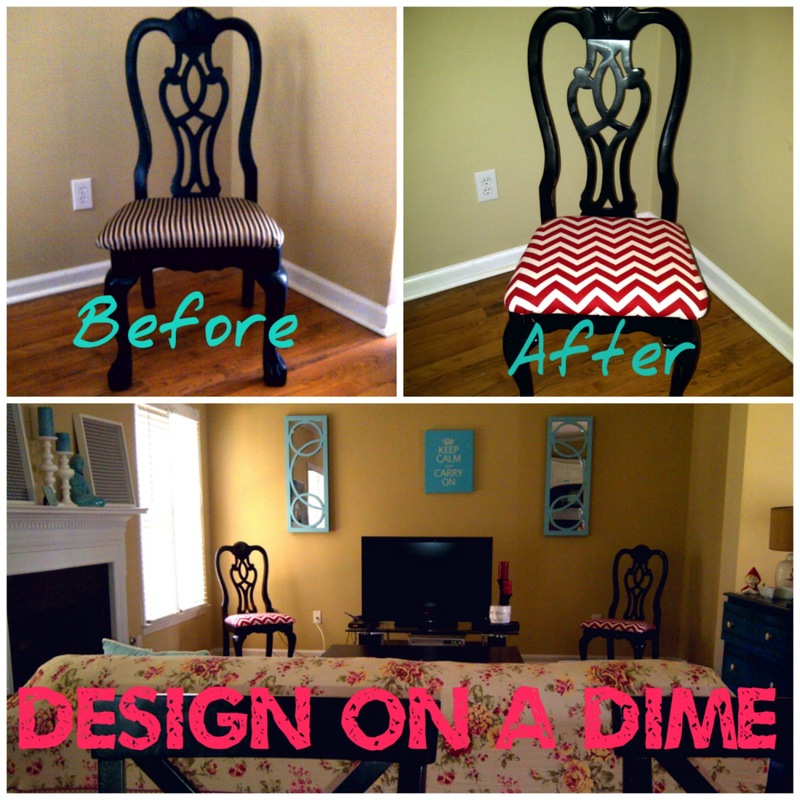 Who knew a little bit of fabric, a staple gun and an old chair can make such a huge difference in a room. The picture really doesn't do any justice to the chairs. They really, really look sooo pretty!